A meeting with Gov.-elect Brad Little, a State Board of Education meeting, and a holiday party. Those are three items on state superintendent Sherri Ybarra’s weekly schedule. The Ybarra-Little meeting is scheduled for Tuesday afternoon. A footnote from last week’s schedule: Ybarra flew to Lewiston Saturday to attend the Idaho Youth ChalleNGe Academy graduation. Originally, spokesman Scott Phillips said Ybarra was driving to the graduation, but he sent a correction late Friday afternoon. This means Ybarra flew to North Idaho twice last week, to tour schools in the Panhandle, and then to attend Saturday’s graduation. The Idaho State Department of Education has articulated its goals for public education in Idaho in terms of outcomes for students, and will give districts and schools the necessary support to reach these goals. 1. All Idaho students persevere in life and are ready for college and careers. 2. All education stakeholders in Idaho are mutually responsible for accountability and student progress. 3. 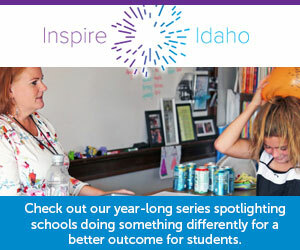 Idaho attracts and retains great teachers and leaders.